I love hearing the great fondness Judy Collins has for Richard Farina and his amazing, mythical contribution to the lyrical sound of the mountain dulcimer. Patriciaâs wonderful in-depth interview reveals an extraordinary break for the mountain dulcimer in its musical debut on Judyâs fifth album when she collaborated with Richard on âPack Up Your Sorrowsâ. I am grateful to the Hearts of the Dulcimer and their dedication to documenting the history of the mountain dulcimer via their podcasts. Thank you for keeping the dulcimerâs spirit alive with the beautiful affection that you do. I wrote a review in the past, but wow! Here is an updated review: Wayne & Patricia just keep following their muse and the music and sharing it widely and with heart. This is one of the treasures in my inbox: a new Hearts of the Dulcimer episode! Essential listening if you love the mountain dulcimer. The interviews are well done, production quality is great, and the music samples are well chosen and long enough to be satisfying. These are great interviews! They truly have a knack for bringing out the interesting tidbits and stories that make their conversations unique! How wonderful of Patricia Delich and Wayne Jiang to offer these very informative podcasts about dulcimer music and musicians. Fantastic Podcast From Hearts of the Dulcimer!! I just listened to the Appalasia Podcast, and it was so informative and entertaining!! I am familiar with the group, have both of their recordings, and have heard them live recently. Wayne and Patricia asked just the right questions to bring out the more interesting genre-bending aspects of their music and their arranging style. This is a terrific podcast for those interested in the dulcimer, and I will be listening for future episodes!! I am about halfway through the podcasts, and must say that they are very well done and always interesting. The quality is flawless on all of the music. The interviews hold your interest and commentary is right on. Take a listen and you'll agree... Well done Patricia and Wayne! I love, love, loved this episode. I'm getting a full education on the art of the dulcimer. Thanks. Itâs wonderful that this podcast exists for such a foundational American instrument, made while some of the greats of the dulcimer music scene are still with us. It captures the beauty of the instrument and the devotion of people to its preservation and development. I loved it. Patricia and Wayne have a beautiful way of providing interesting, uplifting, memorable podcasts. These podcasts are all a "must hear" for any lover of dulcimer music . The tribute to Judy Klinkhammer is especially dear to my heart. Bravo Patricia and Wayne for undertaking these interviews. All listeners are richer for having listened. To top that you are recording history . Two years ago or so I adopted my first dulcimer and it has been a wonderful experience. Yesterday Jerry Rockwell let me know about Dulcimuse and Heart of the Dulcimer. After listening to the podcasts about Judy Klinkhammer, I am recommending these to all my dulcimer friends and look forward to the rest of this series. Housework is over-rated right?Learning more about the artists and history of the dulcimer is so engrossing and has begun to enrich my love and appreciation of this beautiful instrument even more. Thank you very, very much for your work and sharing. I really enjoy listening to Hearts of the Dulcimer podcasts! The last two episodes about Judy Klinkhammer were very well done. Although I never met her, I know she was a kindred spirit. I especially liked the glimpse into the lives of my old friends, Mary and Jack Giger. I'm glad they are still making sweet music together. That there is so much to say about the dulcimer? I am learning volumes, but mostly Iâm enjoying the music. On my subscription list! Hearts of the Dulcimer is one of the coolest things to happen to the mountain dulcimer since Jean Ritchie brought it out of the hills of Kentucky. Patricia and Wayne have done their homework and paid their dues: historical research, interviews at the source, travel to the musicâs roots, performing live on this most unusual instrument, filmmaking, podcasting, plogging on Facebook, all in pursuit of understanding and enjoying the mountain dulcimer. From the podcast, I was inspired to check out both Joni Mitchell's and Mimi & Richard FariÃ±a's music and got to know a little bit about a lot of people active in the mountain dulcimer community. I decided to start playing the dulcimer a few weeks ago, and the podcast definitely played a part in that decision. It is rare to find such a unique combination of knowledge, experience and passion dedicated to one topic in media today. This special podcast brings us a first hand account of the mountain dulcimer history, craftsmanship and musicology in the American landscape. Whether you are a traditional music buff or just interested in history, this is a "must listen", that will warm your heart and inspire your passion. This podcast provides wonderful information about the revival of interest in the mountain dulcimer. Wayne and Patricia do a great job of telling the story. A little slice of music history! An extremely enjoyable experience; listening to stories about gone by era and part of the California counter culture. Good job Patricia and Wayne! This looks like a great new series for dulcimer players. The podcast is presented by the same folks who did such an outstanding job on the "Hearts of the Dulcimer" documentary. Great Hearts of the Dulcimer podcast! I enjoyed watching the Hearts of the Dulcimer film, and am glad to hear that Patricia Delich and Wayne Jiang have started this podcast. If you enjoy folk music and dulcimers, I'd definitely recommend subscribing! 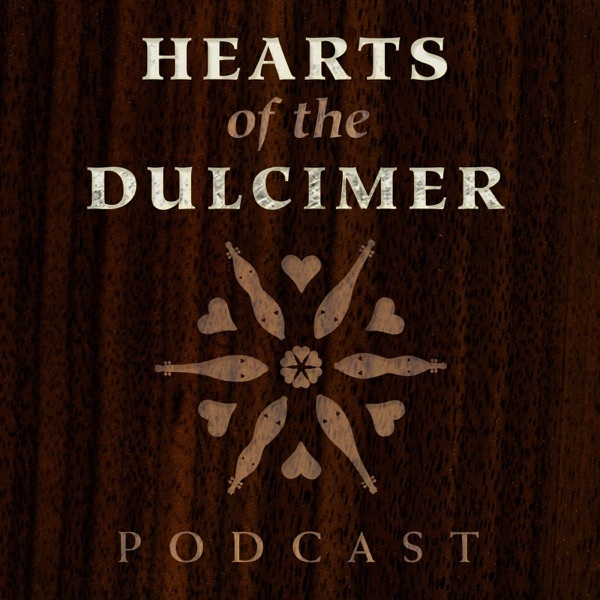 The Hearts of the Dulcimer documentary was a fabulous film, and now the artists are continuing to support dulcimer music and musicians through podcasts. The first podcast was informative and entertaining. I can't wait for the next installments. Patricia and Wayne have done it again. Their excellent insights into music, particularly the mountain dulcimer are not to be missed. Subscribe to the podcasts so that you won' miss a minute of their coverage. Fantastic, looking forward to more!